A red squirrel expert warns some of the mammals could die as a result of a 50-year management plan at Newborough forest on Anglesey. Dr Craig Shuttleworth said the squirrels will not have enough room if areas of woodland are cleared. The Countryside Council for Wales, and Forestry Commission Wales (FCW) said the work is essential to protect the Special Area of Conservation (SAC). 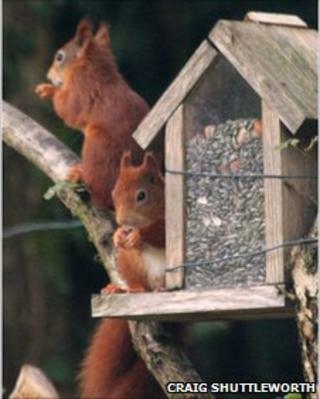 Red squirrels began to be reintroduced at the site in 1998. It has taken nearly of seven years for the management plan to be "mostly" agreed on. The remaining areas of contention - which includes clearing some parts of woodland - will now be dealt with by an arbitration panel of experts. "You can't go drawing lines on maps and not take account of the squirrels, nor seen any assessment of the impact it would have," said Dr Shuttleworth. "From my personal point of view, looking at the distribution of reds in the forest, there are significant numbers of reds in the area which may well be clear felled," he said. "Some animals may try and move, but we know from previous research that a lot of the animals just die," he added. He said he was happy for the matter to go to arbitration, as there was a "strong case" to stop the clear felling and permanent removal of forest. "There is no justification for felling," he added. The Countryside Council for Wales is advising Forestry Commission Wales on forest management for 'multiple objectives' at Newborough. It includes not just red squirrels, but also the long term management of dune habitats and species, and the changing shoreline under climate change scenarios. There is also a bid to improved the area with a more mixed and resilient woodland instead of the present pine trees. Tim Jones, north Wales director of the Countryside Council for Wales (CCW), said the aim of the management plan was to get the best out of the area for both local people and the wildlife. The forest formed part of a sand dune system which had been recognised as the best in the United Kingdom, or even Europe, because of its size and diversity. "What CCW are proposing would have no impact at all on the squirrels, as there is plenty of forest for the squirrels," he added. John Bryant from the Forest Commission, said the 50-year plan would result in a better forest because thinning out the trees would help get rid of disease. It would also help the squirrels because the remaining trees would grow more vigorously, and provide more cones, whilst "uneven" thinning would allow the creatures to move around the canopy, he added.